According to NPR, Michael McDonald, a professor at the University of Florida who studies voter turnout, estimates that 45% to 50% of eligible voters will cast a ballot this fall. Such a level has not been reported since 1970, when 47 percent of voters turned out for Nixon's second midterm election. 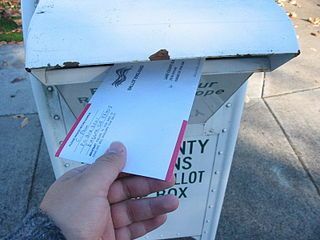 Subject: A voter returns his vote-by-mail ballot in the 2006 General elections in Lane County, Oregon. | Date: 10/22/2006 | Photographer: Chris Phan | This file is licensed under the Creative Commons Attribution-Share Alike 3.0 Unported license. Newscasters and pundits are hailing 50% as a great turn out. I on the other hand am appalled by the numbers. Half of our population are throwing away their right to vote. Meanwhile, in Georgia a bus load of the elderly African Americans were on their way to vote early when city officials stopped the bus and made them go home. If that's not bad enough, North Dakota has a new law requiring an ID card with a street address in order to vote. The problem is Native Americans who live on the reservation don't have street addresses. The law was designed to keep Native Americans, who usually vote democrat, away from the poles. While the African Americans in Georgia and the Native Americans in North Dakota are doing battle in the courts for their right to vote half of us, who are able to vote, are choosing not to. While it's their right not to vote, as long as they don't I don't want to hear any of them complain that they don't like the way things are. Voting is not only a right it's a responsibility. It's a way for a citizen to add their voice to millions of other voices. Those voices, act together to shape our country into what we want it to be. Those who vote contribute to the greater whole. Thus, they have a right to speak up afterwards. Those who choose not to participate give up the right to belly-ache afterwards. A little over two weeks democrats will have an opportunity to take control of congress. If they succeed it will be a big step towards holding our President accountable for his actions. This can only happen if people of good conscience choose to exercise their right to be heard. On the flip side those who like the way our country is going have the right to make themselves heard through the vote as well. I can respect a person I disagree with who votes much more than the person who cannot be bothered to vote.